Welcome to Valentine's Day - February 14 educational activities, lesson plans and crafts for toddlers, preschool and kindergarten. Most of these activities are suitable for many holidays: Mother's Day, Father's Day and Grandparent's Day. 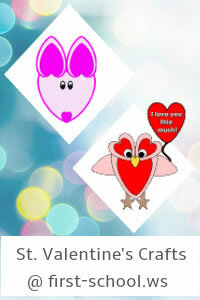 Alphabet lesson plan & printable activities, healthy heart, Bible verse. A start dot to help remember where to start writing the letter. The top line is to practice writing given name.